My sister bought me a diffuser for Christmas and honestly, best gift ever. She got me some allergy relief/breathe easy blend and I don't feel like crap too much anymore. I've heard some good things about essential oils/diffusers from a friend who uses them. I also know that many essential oils, like eucalyptus, are toxic to cats and/or dogs. Good thing I don't have animals..? I just bought a bunch of new watercolors. I got a book called Everyday Watercolor because I've decided I need to properly learn how to paint and I decided I needed the color palette that the author recommended. 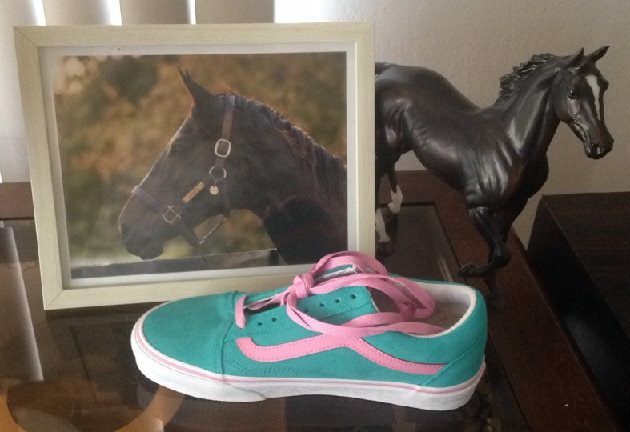 custom Zenyatta shoes came in today because some of us are still in love. wheres' the heart eyes emoji? Good news from the oncologist today - CT scan and bloodwork came back clean. No sign of a reoccurence of cancer. Don't have to go back until September. Two years down; three to go. Can now plan for trip tp Kentucky in May and spending the summer in TOGA. Doing the happy dance. Great news, Bal. May all your follow-ups be nothing but good news. Ballerina wrote: Good news from the oncologist today - CT scan and bloodwork came back clean. No sign of a reoccurence of cancer. Don't have to go back until September. Two years down; three to go. Can now plan for trip tp Kentucky in May and spending the summer in TOGA. Doing the happy dance. So last night after leaving The Great Race Place @ SanterAnita I ventured down the road to Pasadena to one of my olde favourites for dinner, Green Street. Something I had forgot about when ordering iced tea as my beverage choice, the waiter asked.....DECAF or Regular? A bride-to-be was brought to tears when her fiancé arranged for her beloved horse to visit her in the hospital. Christine Carbonneau was feeling depressed after recovering from a monthlong induced coma after being struck down with pneumonia following an operation to remove an abdominal blockage. I don't know how my tiny ancient apartment and my tiny local electrical company did it, but I am insanely lucky to have power and an intact house right now. I am happy with just a beautiful Latte bowl! Coffee lower!!! And that is the truth. After being in the hospital for close to 2 months, I went to rehab where I sunk into deep depression. My husband with the help of a friend and the permission of the Rehab Center got Joey & Tuffy in to visit me. It was an amazing transformation. And it was all the better that they were as happy to see me again as I was them. Hospitals. etc. are allowing this more and more. Years ago we had a couple of our dogs go through Service Dog Testing and we took them for visits to a local old age home. Most residents were thrilled to see, pet, and give the dogs treats. One lady brought me to tears when she said, "You and your dogs are my only visitors." When my 3 yr old was hospitalized over Christmas/New Year's, a therapy dog came and visited. English Setter named Goober. My kid was thrilled - until Goober took over his bed.